PURPLE — Why did you come to Tokyo from London? BELLAMY HUNT — That is a very long story. I was traveling the world and just found myself in Tokyo. I originally intended to stay for a few months. It will be 12 years next year. PURPLE — How would you describe your job? BELLAMY HUNT — I don’t know, as I have many jobs. I source cameras and lenses, I sell my own brand of film, I promote film photography. I guess “camera broker” would be a fairly accurate title. PURPLE — Do you have Japanese friends? Do you know other people who do the same kind of camera-hunting work that you do? BELLAMY HUNT — I know some people, but they are quite private. I don’t really know anyone who does exactly the same thing as me. PURPLE — How would you explain the passion for cameras in Japan, compared with that in Western countries? What do you think are the roots of this technological culture? BELLAMY HUNT — This is very difficult to answer without a very lengthy response. The Japanese have a great appreciation for things that are either technologically or mechanically excellent. Be it cars, watches, cameras, or music boxes. They are also great collectors of things. I can’t really say where this comes from without a lengthy anthropological essay. PURPLE — There was a historical connection between the photo industries in Germany and Japan, from a technological point of view. Germany has Leica, Leitz, Zeiss, Contax. The Japanese camera industry — with Nikon, Canon, Olympus — copied, improved, and expanded photo possibilities. 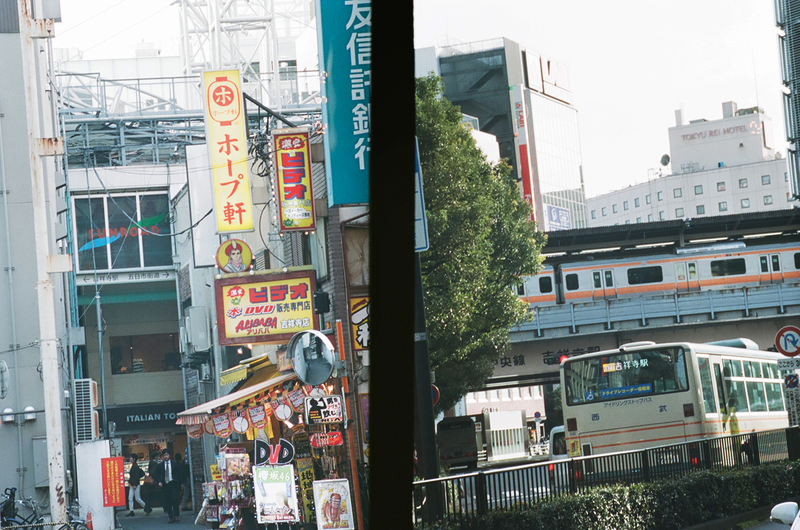 Do you see this as the start of Japan’s camera culture? BELLAMY HUNT — Yes, there is a long history of the Japanese companies taking the ideas from other countries and improving or developing them. I think there was a certain amount of national pride for some of the cameras that came from this, like the Nikon F and so on. This really cemented the culture in Japan. PURPLE — Did you know Yoshihisa Maitani, the famous Japanese camera designer and engineer? Are there Japanese camera engineers today who are considered cult figures? BELLAMY HUNT — I didn’t know him personally, but I have heard of him. There are a great many “masters” in Japan. [Sadayasu] Miyazaki of MS Optical is one of them, creating stunning modern classic lenses. PURPLE — Why do the Japanese take such good care of their cameras? 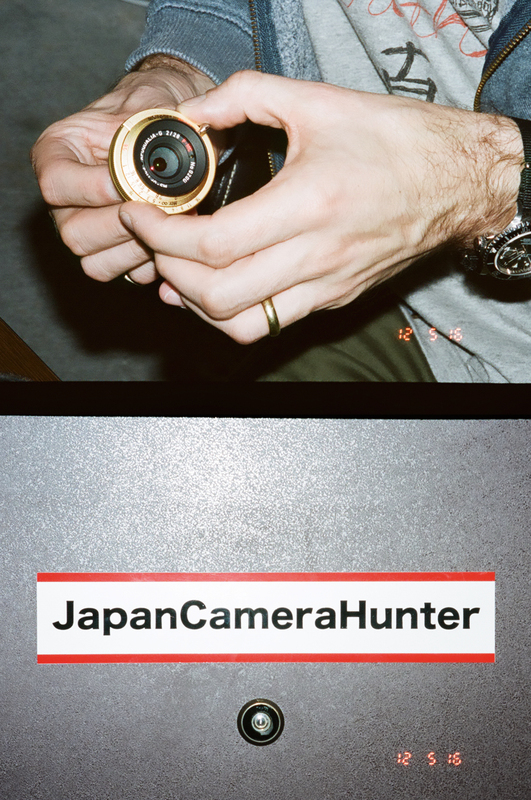 BELLAMY HUNT — The Japanese seem to have a respect for the items that they own, which I have not experienced elsewhere. I guess it comes from working hard to obtain an item — this gives you a healthy amount of respect for the items you own. PURPLE — How would you describe the creative community of photographers who collect and use vintage cameras? What do they do, and where do they meet? Do they exchange information? BELLAMY HUNT — There are a lot of collectors’ groups that meet up and talk about their collections, but they are quite private. PURPLE — How do you find the cameras that you sell online? BELLAMY HUNT — I have a lot of connections with stores and private sellers/ brokers in Japan. Sometimes I find them; sometimes they find me. Some people seek me out to sell their items for them, which is an honor. PURPLE — What is your favorite film camera in the three categories: reflex (SLR/TLR), rangefinder, and medium format? Which one would you run away with if your house caught fire? BELLAMY HUNT — That is difficult. I guess my favorites would be the ones that I have personally owned. I love the Nikon F3 for the reflex category; it was one of the first cameras I aspired to own. The Leica MP is my favorite 35mm rangefinder camera. And the Makina 67 is my favorite medium-format camera. PURPLE — How do you choose the cameras you sell: design and aesthetic, ergonomics and comfort of use, image quality, versatility, favorite brands, or anything else? BELLAMY HUNT — Well, mainly people ask me to find something. It is rare that I find items to sell directly now. The main thing I look for is quality. Everything else is secondary. PURPLE — You are producing your own film. Why did you decide to do this? BELLAMY HUNT — I really wanted to try and do something positive for the film community. It was a dream of mine to do it, and I made it a reality. It was hard work, but definitely worth it. 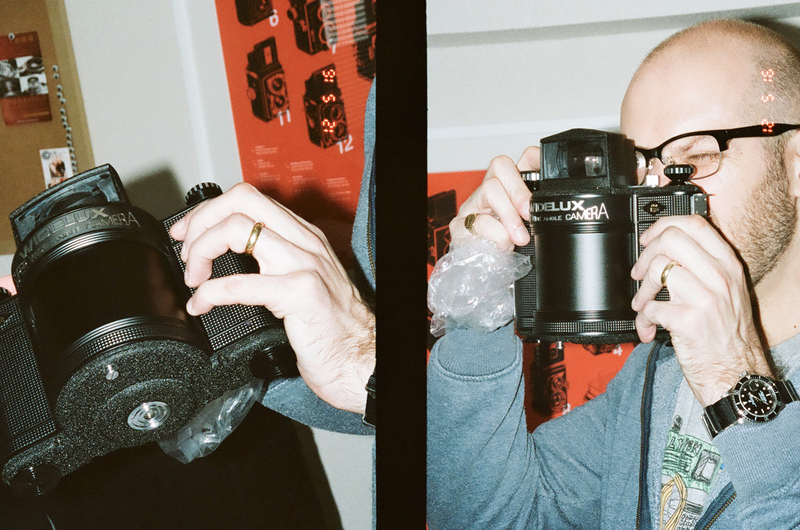 PURPLE — How do you explain the major comeback of film cameras today in the creative community? BELLAMY HUNT — I think there is a lot more awareness that film photography is still available as a medium of expression. There is also a trend for people to move parts of their lives off-line now, as it sometimes seems we are doing everything at a rapid pace for everyone to see. There is an appeal for people to create something that is not just for Facebook updates. PURPLE — Do you like to shop in Japanese vintage camera shops? BELLAMY HUNT — Of course. I wouldn’t do it otherwise. I love my job. PURPLE — Where do you find cameras to sell, apart from vintage boutiques? In Japan? Outside Japan? BELLAMY HUNT — I have sources all over the world, though I can’t tell you where they are because of client confidentiality. PURPLE — Do you collect cameras, besides the ones you use? BELLAMY HUNT — I used to, but I don’t do it any longer. I find cameras for other people and have owned everything I could possibly want to own. I now keep only cameras that I use. PURPLE — Who are your customers? Are they mostly Japanese? BELLAMY HUNT — I try to get to know my customers, as I would like them to feel comfortable when buying from me. Actually, 95% of my customers are from outside Japan — from all over the world. I have had customers from Mongolia to Miami. It is a worldwide business. PURPLE — In addition to selecting cameras for your customers, do you also give tips on repairing or customizing the camera? Is that important? BELLAMY HUNT — Yes, I try to give my customers advice on anything that they need. 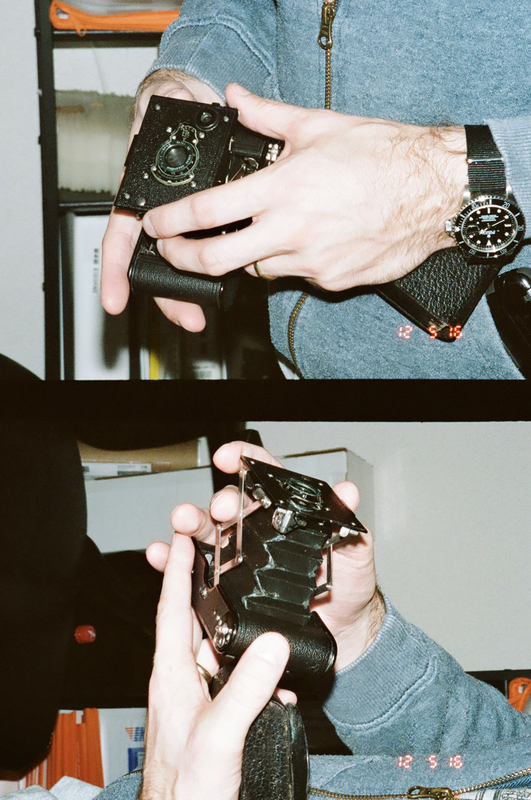 I also curate their collections for them and help them to design and visualize custom cameras. PURPLE — What do you think about camera customization? BELLAMY HUNT — I’m all for it. I think people should be able to express their personalities through the things they own. That’s why I help people to create custom-designed cameras.